I'm still slogging it out for the '40' Great Nail Art Ideas - 52 week challenge, which we are now well past half way on. In fact we only have 4 months left, which in the scheme of things is not much. 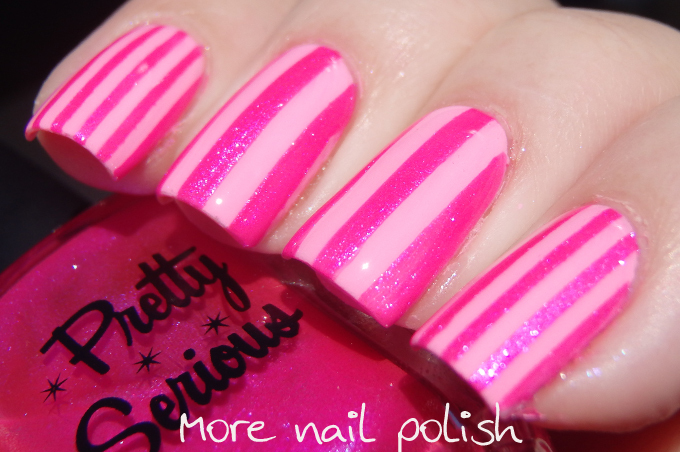 This week's prompt is hot pink and my individual prompt was stripes. I used some narrow and wide nail vinyls, and whilst I do like the mix and match of the widths, I think I prefer the narrow stripes and wish I'd done them all in the narrow stripes. The base colour is Pretty Serious Fluffykins from the Pastel Pet names collection that launched for general sale today, and the stripes are done with Pretty Serious The Pink One. For a gal that doesn't wear much pink, I really like this one. The Pink One is such a great shade, I love every mani I've used it in. Your mani is so cute! 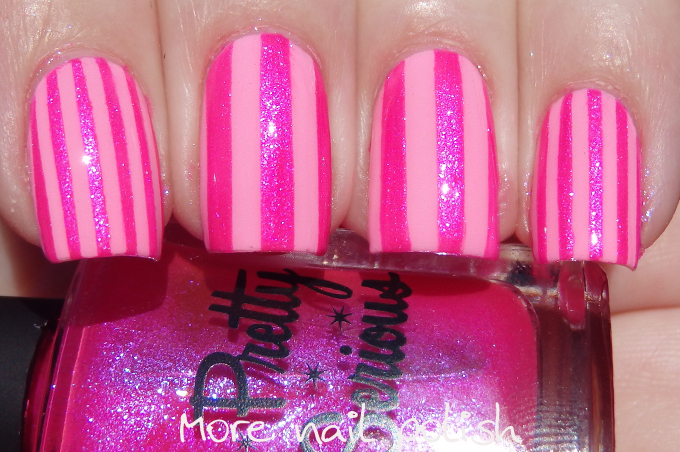 I like the nails with the different widths of stripes - it breaks it up. And those polishes! I saw an announcement about the pastel pet names polishes and loved them. My weakness is pastels and when there is a photo of the pretty little bottles together, oh my. Hahah, I want them! And I have debated on The Pink One - I am just now getting into Pretty Serious polish and that one has caught my eye. I can't get all the ones I want - that silly bank account frowns at me! In time, I will have more Pretty Serious polishes, though!